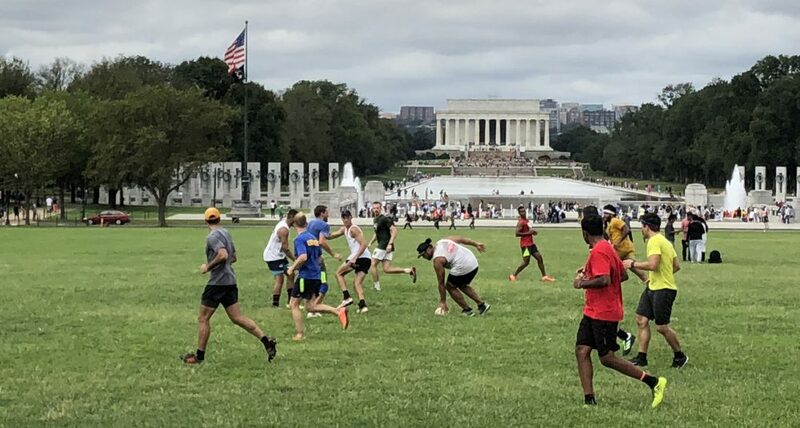 We are a group of rugby fans that like to meet in the Washington D.C. metro area to play an informal and very much social game of touch rugby. Touch is a fast-paced and fun game that is suitable for all ages and skill levels – and it’s a great way to meet people and stay fit! Some of us have played rugby for many years, some converts from flag football and others are completely new to the game. We always welcome new people to the group so please join this blog and stay updated with the latest game info! Hi guys, I just came across this site and wanted to know if you have any room for new players? I used to play with a group in Houston but I haven’t played in 3 years so I’d be a bit rusty. We certainly have room for more players. We take anyone willing and interested, be they newcomer, vet, or current player. We’re a welcoming bunch. We’ll likely be playing again this weekend (April 13th) in Adams Morgan. Follow the site to keep up. Hope to see you there! Hello Sam, I would love to join as well. I have play both rugby and touch rugby and have been looking for a group in DC. What time and where exactly will you be playing on the 13th? Glad to see that you’re interested too! Follow us, and visit the Home Page to see posts about when we’ll be playing. I’ll post momentarily about this week. Be sure to comment on the posting if you can make it out or not. Hope to see you out there! Do you guys play all year round? I’m moving to the area in the summer and would love to get involved. Yes we’ll be playing as much through summer as we can (depending on the heat). We post mid-week every week to provide info on Saturday morning games so be sure to follow us! We are the number 3 spot when you search “rugby DC” in Google!!! Columbia, MD touch tournament on 13 JULY? Also, we play every saturday morning in Columbia (www.columbiatouchrugby.com) and during the summer the Wildgeese have a touch session in Potomac, MD. See tab above “Game Time and Location” We will not be playing on the mall this Saturday as we will be at a tournament. Posts are made midweek to arrange Saturday games, so be sure to subscribe. Are you still accepting new players? I played for about a year for a team here in D.C. but got too banged up. I love the sport and am looking for low- or non-contact alternatives. Hi Paul! New players are always welcome. We play a friendly game and earnestly try to minimize any inadvertent collisions. Follow the home page for updates on when and where we’re playing! It was great to have you out on Wednesday. You can run with us whenever you’d like. Any addition is a welcome one! I’m moving to DC round February/March next year from Australia and I came across this website unexpectedly. I would love to come out for a run if you guys are still playing next year! We’ll definitely be playing next Spring, but February might be a bit early. It’s all weather dependent. In the meantime, you can follow the blog to stay connected with the team (or you can start following when you arrive in DC). We always welcome new players and would love to see you out there. Do you mind if Columbia comes to DC for a few matches? who is available. We will need exact address/location. The Wild Geese Touch tournament is on June 14th, Last year you all had a great showing and good games, are you coming this year? We actually have a surprising amount of people that are going to be away that weekend. I’m trying to pull together numbers for a single team. I should have a better handle about things this Saturday. Will touch be on this weekend where and what time? I’m sorry I didn’t get back to you earlier. We typically play every Saturday at 9:00 AM in the Summer, and 10:00 in the Fall and Winter. We always play at the same location too–17th and Constitution. If you’re interested in playing, please come join us. You can stay notified about if and when we’ll be playing by subscribing to this blog. In the Summer, we also play on Wednesdays. My girlfriend and I are moving out to Washington in early September for 12 months. Do you guys play all year round or just the summer? We play year-round. Feel free to come out and join us. Hi, I will be in DC from August 18th till Sept 1st and would love a game if there is anything on. Hey guys, I was thinking it might be fun to organize a proper team to play against Columbia, Alexandria, and / or, perhaps, an embassy team. Would anyone be interested? I’d like to put together a few basic skills and strategy sessions and gauge the interest of a match or tournament. Let me know if you’d be interested – john_goodwyn@yahoo.com. I think with enough advanced notice and planning DC Touch Rugby could gather a solid team for some competitive games. Keep us in the loop. That’s what I’m trying to get organized. I’d like to put together a team first and see what we have, and then see if the other teams would be interested. But I think it starts with gauging the interest level, then working on skills and strategies – 2 things we don’t really do on Saturdays. Hi guys. I always wanted to join a rugby side but my old work schedule prevented me from joining. Plus I’ve never played before. I’d like to come out and see what it’s all about. I’ve been playing rugby for 3 years now and would like to come get a run tomorrow. I’ve also got a friend who’s never played but is interested who wants to come out. Are you guys good with us just droping by tomorrow morning? Is still something that happens every Saturday at 10am. Sorry, the last comment was from 2013, and I just want to make sure. NVM…The current comments are towards the bottom of the page. See everyone this Sat. Hello I’m in DC for this 4th of July so im a tourist from Sourh Carolina and was just hoping to have a little fun before i leave. If you guys could contact me back for the Saturday game with information as to the game being cancelled or not. I have played rugby for 5 years so i know my way around a ball. Thank you guys!! Anyone is welcome to play. Although we don’t currently play with any youths, one or two have played with us sporadically in the past. If you can keep up, we’re happy to have you come out. Yes, there’s plenty of room. Come out anytime. We always welcome new players. We play Wednesdays and Saturdays at 15th and Independence. Follow the blog for updates bi-weekly updates on playing. Huge rugby fan. Never played touch but I’d like to. Can I just turn up on Saturday morning? Yes absolutely! Feel free to join us on Saturday mornings at 9:30 am and Wednesday evenings at 6:00 pm. It is also very helpful if you subscribe to follow this blog (link at top right corner of the page) so that you will get current updates on weekly touch rugby sessions. Hello, looking for a game on aug 20, in town for a couple of days. Are there any touch games that weekend ? Hi I’m going to be in town this weekend and I was wondering if there was going to be a game on Saturday, December 31st? Hi in DC for the next few days for work. Is there space for one for tomorrow’s game. Hey there! Recently coached at GW and am looking to get back into the game. When is a good time to show up? It’s a very casual pick-up game we play regularly so you can feel free to come whenever you can make it. We’re playing Saturday at 9:30 so stop by then if you can make it. Hi I’m new to the area and looking to play touch. Where do you guys typically get together? Prior experience necessary? Just moved to DC from London and want to keep playing, have played 15s, 7s, and touch in several countries. Probably available in 2 weeks time, you guys open for new players? I would like to know about practice time and location. Would love to join.